FOOD RATING Delicious. A highly satisfying experience at a reasonable price. A great way to eat green without sacrificing taste. GREEN RATING Quite Green. Vegetarian. Organic. Recycling. Fair Trade. World Peace Cafe (WPC) is an organic vegetarian restaurant and cafe run by dedicated volunteers. Its a tranquil spot for lunch (Mon-Sat) or dinner (Fri, Sat only) in the heart of busy Wanchai. Like most non-vegetarians, you may be wondering can a meal without meat really be satisfying? The answer is a definite yes! The 4 course set menu that changes weekly (includes a soup, appetizer, main, desert and a choice of fair-trade coffee or herbal teas) will leave you feeling satisfied and energized. It’s a great choice if you’re looking for a healthy, delicious lunch that doesn’t weigh you down. Packed with nutritious, organic vegetables seasoned with organic herbs and sea salt the soups are a real treat. The appetizer is usually a delicate affair of salad or beetroot and tofu. There are always 3 choices for the main. There is usually veggie burger or mixed grilled veggie sandwich with pumpkin and potato fries. A pasta, such as aubergine and tomato sauce on handmade noodle or a lasagna. Or a rice mains such as rainbow vegetable sashimi or a banana curry with mixed pearl rice. 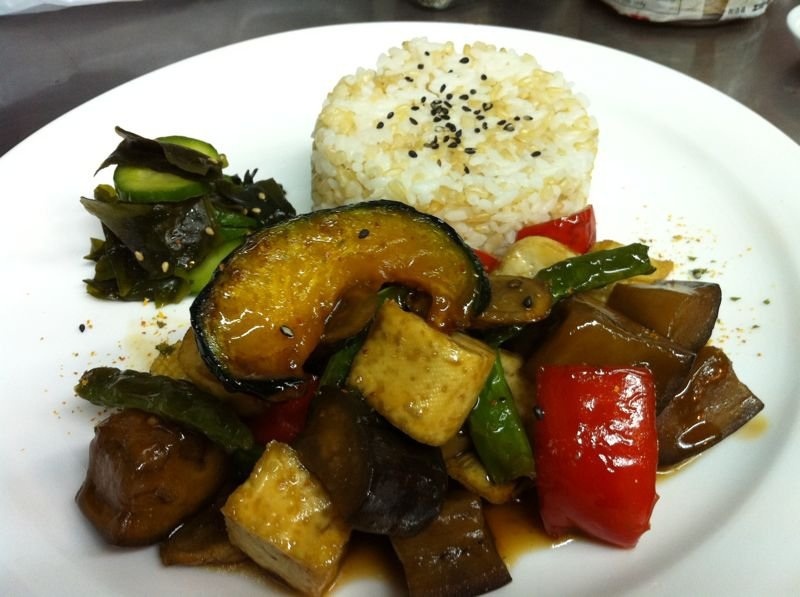 Each meal is made with a healthy mix of organic vegetables and tofu or cheese. The sauces for curries and pastas are made from fresh vegetables and olive oil only, with no starches or flour added. Topped off with a delicious tofu cheese cake and herbal tea, you won’t wonder anymore if you’ll feel hungry after a vegetarian meal. The food, however, may be a bit slow in arriving or may be a little inconsistent, a likely consequence of the cafe being staffed by volunteers. Dinners are an intimate affair with cool jazz and warmly lit candles. Dinners are prepared by a team of food-lovers who obsess over every detail to ensure the perfect meal. This is a private kitchen without the difficulty to make reservations and hard to find address. It’s the perfect low-key way to wind down from a stressful week. The meals are sure to delight all the senses from sight to taste. The last menu was a choice of buckwheat galettes (basically a crepe) with salad, sauteed spinach, button mushrooms, and potato cubes, and mozzarella cheese or Japanese style braised summer vegetables with brown rice. Both were fabulous. Again, since the menu changes regularly, the consistency may not always be perfect with some dishes arriving not as hot as we’d like. Meat is a major contributor to greenhouse gas emissions. So having a vegetarian meal is a great way to reduce our carbon footprint. Dining at WPC, you’ll find you don’t need to sacrifice to go green. You feel not only satisfied, but also feel good. The delicious, nutritious meals are good for your health and good for the planet. We give WPC, a Quite Green rating (our second highest) for sourcing organic produce whenever possible, one of the very few restaurants in Hong Kong to do so. The vegetables, rice, pastas, herbs are mostly all organic. The staff at WPC are dedicated to recycling and producing as little food waste as possible. The glass herb jars are re-used for packaging chili sauce sold by GroundWorks (a local social enterprise) and other glass jars are sent to be recycled into pavement bricks. Next Next post: Launch of Go Green Hong Kong!